And the billionaire ancient Egyptian vampire Set was paying a visit to Britain’s House of Lords to see his friend Lord Oswald Jennings give a speech on China in the House of Lords. Lord Oswald Jennings had a son Spencer Jennings who was the British Conservative MP for the constituency of Stamford On The Welland. And Spencer Jennings had an 8-year-old son Byron Jennings. In the opinion of the said vampire billionaire who called himself Mr. Sol Invictus Set, Byron Jennings was a spoiled brat. But fortunately Lord Oswald Jennings did not invite Set back to his home after the speech where his son and daughter-in-law and spoiled brat grandson would be attending. Instead he invited Set to dinner at his club. After dinner and brandy at the club. Sol Invictus Set walked out into the night. He noticed a very attractive young Asian woman walking up the street. She was wearing a black dragon emblazoned red dress slit up the sides in that sleek chic oriental fashion that Set found so arousing. It’s too bad that he had to rush home as he was expecting a phone call from Stanley Baldwin. Otherwise he’d have asked the beautiful young woman out for a drink. But the beautiful young Asian woman had plans of her own. For she was Mei-ling Manchu the real life daughter of the real life scientist Dr. Fu Manchu who was so grossly slandered in Sax Rohmer’s stereotypical books. Her father feared that Lord Oswald Jennings was far too sympathetic to the idea of Japanese control over Manchuria and quite possibly the rest of China. Thus he had instructed Mei-ling to kidnap Lord Jennings’ grandson Byron hoping to influence His Lordship away from a pro-Japanese position. How Mei-ling wondered, would she do it? She noticed a boy standing at the corner looking through the window of a bookshop. She looked at the photo of Lord Jennings’ grandson that her father had given her. Then she looked at the boy on the corner. They were the same individual. She walked up to the boy. 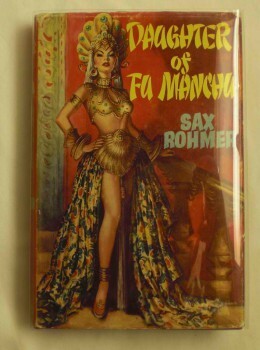 Ironically, the boy was looking at the cover of one of Sax Rohmer’s stereotypical books. “Oh, this was going to be easy,” Mei-ling smiled to herself. “How’d you like me to take you to my home and give you a spanking?” Mei-ling adjusted the slit skirt of her dress. So kidnapping the grandson of Lord Oswald Jennings turned out to be as easy as taking candy from a baby. And quite possibly the boy might even cease being a brat under Mei-ling Manchu’s tutelage.